Warwick resident Kelly Santos is the woman behind the business. Kelly Santos with her family. Photograph by Bethany O Photography/Provided by Kelly Santos. How did you come up with the idea for Cart Mama? 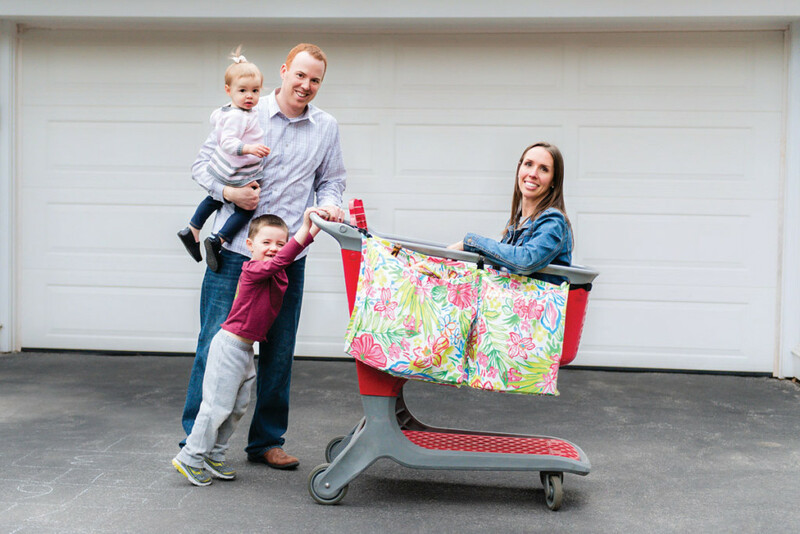 I was grocery shopping with my newborn daughter, Brooke, and my son, Jake, who was two at the time, and I put them both in the shopping cart. We’re cruising down the aisles and I am packing stuff around Brooke while she is still in the carseat in the big part of the cart and Jake is in the seat at the front of the cart. Finally, I ran out of room. I didn’t know if I should get another cart or come back another day. So what did you do? I took Brooke out and carried her on my arm in her carrier the rest of the way, which is so heavy. I rounded the corner with the cart and slammed into a diet pills display and the bottles went into the aisle. It was embarrassing, and I knew I couldn’t be the only one who runs out of room. I looked online, and there was nothing. Given all the gear that’s out there for moms and babies, I was shocked there wasn’t something out there already. It was a problem I had to solve. How does Cart Mama work? With kids, you quickly run out of enough space in the cart, so I created a large pocket to go on the side of the cart, where you can store all the groceries. It has three sets of velcro, so you loop it through the D-ring and push the velcro down on each side and there’s support velcro in the middle to help with the weight. It’s useful if you go to Stop and Shop and use the scanner, because you can scan everything, throw it in the bag and never take it out again. The great thing about the velcro is when you put it together, it forms one big strap, and you can throw it over your shoulder and carry everything into the house. It can hold up to thirty pounds and it’s eco-friendly because you’re not using plastic bags. Why is it a safer option for parents who shop with babies? A lot of moms still position an infant carseat on the top of a shopping cart, but they don’t realize the danger of that kind of situation. This solves that problem: You want to shop in a convenient way with your baby safe and close in the base of the cart, and you also want to make sure they’re protected so strangers aren’t touching them or breathing on them. Babies can even nap in the carseat. It’s even more useful now with two children because I absolutely need more room. My toddler sits in the larger part of the cart, and she’s spunky and throws everything out. Now I put everything in Cart Mama where she can’t reach it.